So this “classic” review actually shows more about how my taste in stand-up comedy has changed between 2002 and now. Back in '02 I was sort of stuck with whatever was playing on various cable networks and whatever I could dig up in the local CD stores. 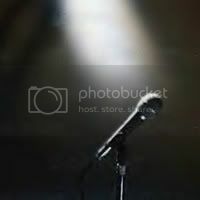 I didn't know of any local comedy rooms, I'd never been to Harvey's (I just found out that they have a show on the CW in Portland Saturdays at 1am. Awesome! ), and the Internet wasn't quite yet at the point that it is now. There was no MySpace, no Facebook, Friendster was around but new (and honestly I never used it). So discovering comedians that way wasn't available. There was no YouTube, which of course meant that the big online video scene hadn't happened yet so that means no Effin' Funny and the like. Podcasts weren't around so again there is a no go. My point? I was really excited and intrigued by the stand-up as a feature length film experience. Also I was starved for different styles of comedy. Little side note; in a bit of happy coincidence this particular retro post coincides a bit with something really cool I found out today. Comedy related-wise. 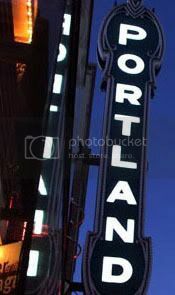 Apparently in early March Portland is going to be getting it's own comedy festival! The Bridgetown Comedy Festival. Not only awesome for comedy, but also because it is helping to raise some dough for the Oregon Red Cross. Now I can't tell you how jealous it made me when I read about the show itself, it is maddening that I'm stuck across the country unable to attend! And then I made a real mistake, I checked out the list of performers. Seriously there are a lot of quality performers going to the show. Eddie Pepitone, Tig Notaro, Matt Braunger, Natasha Leggero, Michelle Biloon, and Morgan Murphy are the names on the list that were I able to attend I would make sure beyond doubt to try and see perform. I'll be honest, I'd kill to see Tig and Morgan Murphy perform live (so if you go see their shows you can probably get a good idea of where my head is at comedically)! So onto the old crap! First off I'll say if you go see this movie, when you get to the ticket counter just say 1 ticket (or however many you want) for Martin Lawrence. I made the mistake of saying 1 ticket for Run Tel dat please, and the cute ticket girl had NO IDEA what I had just said so after a repeat of the title I said the Martin Lawrence movie. We both had a laugh at it, her it may have been genuinely funny me nervous embarrassment as usual. Now onto the movie first things first, this is basically his Stand up act on the big screen, but there is a small film about 10 minutes or so that starts it. The film recaps Martins life basically with the focus on the problems he has had, some good stuff here and actually some sincere words mixed in with some jokes. Now onto the stand up, I make no secret that I very much love a good stand up concert and ol Marty Mart didn't disappoint me here some good stuff some great stuff and for me only a few instances where he wasn't completely funny. By the way the parts where it wasn't greatly funny to me it seemed like they were planned in there to give you a break, there were literally times during the movie where laughter was robbing me of precious oxygen. Compared to You So Crazy I would probably say on the whole You So Crazy is the better show, but with stand up you also have to look at how topical it is, and newer may not mean better, but variety does equal better so having 2 or 3 solid shows available is a good move I feel. All in all I would say this movie was worth my time and money. On a side note I wish a few more comedians would take the Original Kings of Comedy & Martin Lawrence route and do a near 2 hour set for the big screen, or have a couple team up like in the kings, a few of the people I think could pull it off are George Carlin (of course), Denis Leary, Chris Rock, possibly a combo with Jeff Foxworthy/Bill Engvall, and I could even see Howie Mandel pulling off at leas partial duty in a big screen stand up trial. Anyway that's enough of my mindless ramblings for the night... or more accurately morning so I'm outta here for now. 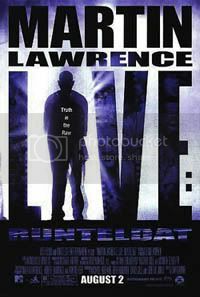 “Martin Lawrence: Run Tel Dat”: So not all that long ago I actually caught most of this on cable and to tell you the truth, I was really bored. A few decent jokes aside the majority of the show just wasn't up to snuff, the lows of the valleys were just too vast for the peaks to make a dent which is really sad. I still believe that “You So Crazy” holds up and the TV show “Martin” I'll still hold that in quite high regards, but “Run Tel Dat” I think it was just the novelty of the venue at the time that kept my interest so high. The material just didn't speak to me at all. Now to be fair and in the spirit of the rest of this post about comedians I will say that Martin definitely still had his stage presence and timing honed. He definitely can hold a stage without a problem, but this particular set just didn't do it for me...Sorry Martin. Another side note, I don't know if you noticed it or not but I totally called the “Blue Collar Comedy Tour” in my old post up there. Well half it it anyway, at the time I didn't know who Larry the Cable Guy or Ron White were....I'm just sayin' a piece of the action would have been nice.